Whilst on my poor knees the other day, drilling away on the subject of a future blog post, it occurred to me that -- despite the sore knees and aching back -- building this boat was the most fun I'd had in years. And I wondered why, why it was so much fun? It surely isn't the boat itself, or the future of rowing and sailing it promises. If I'm honest, I don't particularly need a small boat to go sailing. I did plenty of sailing this summer on other people's boats. No, it's not the destination of completing the boat, so much as the journey of building it. It's the thrill of the possibility. The high of anticipation. The first date with a band saw. That's what makes building boats so much fun for me. I think I've mentioned before that this blog is not a how-to -- only a damn fool would try to learn how to build a boat from a complete novice like me. There are many boat building books (BBBs) that explain in detail the correct way to loft, or pick up a pattern, or do any of the million things you need to do to build a boat. Unfortunately, boat building is an art, not a science. Thus the BBBs leave you plenty of room for 'creativity' -- that is, errors -- and I'm pretty sure I made every error possible in 'picking up' the patterns for Cabin Boy's bones.That's why I call this blog a how-not-to... Here we go. After lofting the body plan, the next step was to build the 4 bones -- or molds -- that Cabin Boy's skin would be bent and shaped over. It seemed like a pretty simple process. Just cut a few boards to the correct shape, and screw together. Easy-peasy. Even I was able to do this without much fuss. 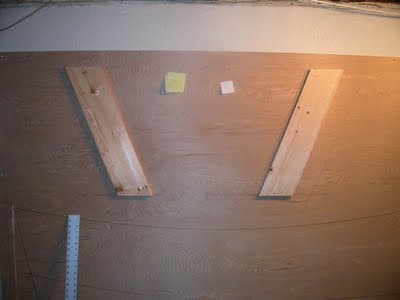 Just line up a board with the side of one of the body plans, tick off the bottom line and floor line on the inside and outside of board, connect the ticks, and saw off straight. Then just tack it onto the lofting board with some small finishing nails, leaving the heads sticking out a bit so you can pull them out later. I will say again that this would have been easier to do if my lofting board had been on the floor, instead of on the wall. It is pretty awkward to line up a long board with a pencil line, and to hold it exactly in place while ticking off the floor and bottom lines. Gravity was definitely NOT helping! But with ample cursing and a Blue Moon or two, it can be done. Next, I cut out and screwed on the bottom piece (I'm sure there are actual names for the pieces of a mold, but I don't know them. If you do know them, please let me know!) To keep the lines stable, I was careful to use 4 screws in each corner. The final step is to remove the almost-finished mold from the lofting board and attach the floor piece... Again, using 4 screws on each leg, just to make it really solid. Hadn't I read something, somewhere, about the body plan sometimes being drawn to the outside of the plank, and sometimes to the inside? This is an important distinction, because if the plans are drawn to the inside of the plank, then my form was the correct size, because it would be the inside of the sides and bottom that my form would touch. But if the plans are drawn to the outside of the plank, then the builder must reduce the size of the molds by the depth of the side and bottom planking. As I recalled, this should have been clearly marked on the plans. I studied them... carfully. Not a word. Now what? Maybe I was lucky and John Atkin had sensibly drawn the body plan lines to the inside of the plank? I re-read the lofting chapters in all my BBBs. They all agreed: The default -- if not specifically spelled out on the plans -- is to measure to the outside of the planking. This is the most flexible way to draw the plans, since plans are really just a guide... the designer has no idea what size planking you will use, so he leaves it up to you to buy the planking and then reduce the molds by the correct amount. Very sensible, really... only my beautiful mold was wrong. 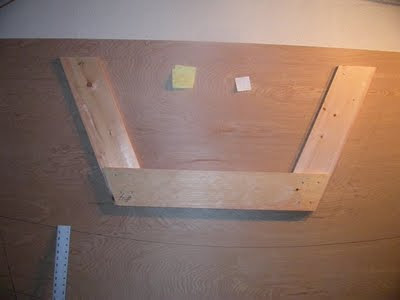 I'd have to to re-do the body plan on my lofting board to take into account the size planks I would use on the bottom and sides. 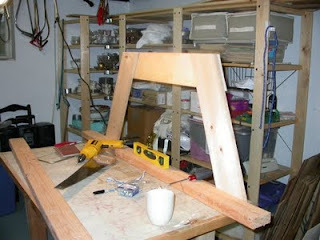 Then I could remove all 16 screws from my mold, re-cut it to the correct size, and re-assemble it. And that is what makes boat building so much fun. 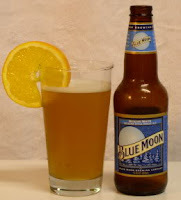 Another Blue Moon was in order.